“The only thing that touches you is the satisfaction you get when you are happy and fulfilled while discovering the journey of life” Aziz Ampanwala. 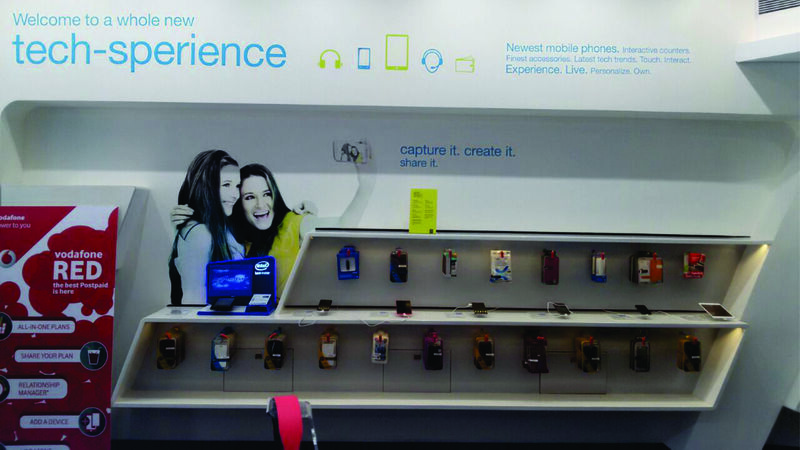 Last week was a special day for me, not for many but one reason, I got a chance to visit one of the big retail mobile chains “Univercell” thanks to folks at indiblogger who had organized it and gave a chance to experience and explore the store in-depth. 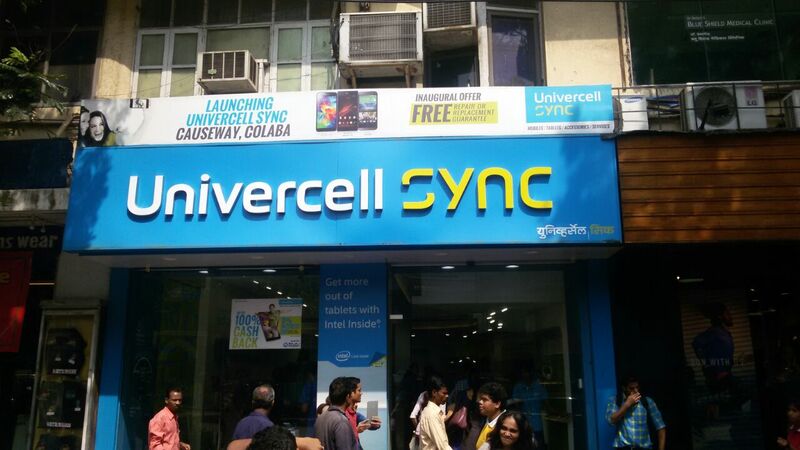 Univercell is one of the biggest mobile retail chains in India with a whopping INR 1000+ Crore turnover till date, they started off in 2000 with 1 outlet in Chennai and swiftly moving with time and expanding to nearly 450­+ mega retail stores all across south and west India up till today and are planning to create their strong existence in North and east India in the coming years. Venue: Univercell – CECIL COURT BUILDING,, NEXT TO REGAL CINEMA,, CAUSE WAY, Mumbai – 400001. 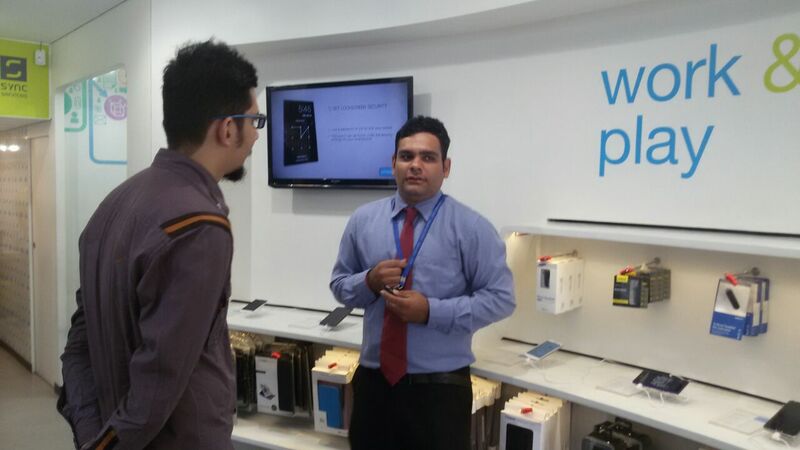 As I walk in the store I was greeted and welcome by the Store Manager who gave me a brief about the company and made me more aware about the service centric culture at Univercell which they follow and aim to achieve for customer satisfaction, which I shall discuss and elaborate in the article ahead. 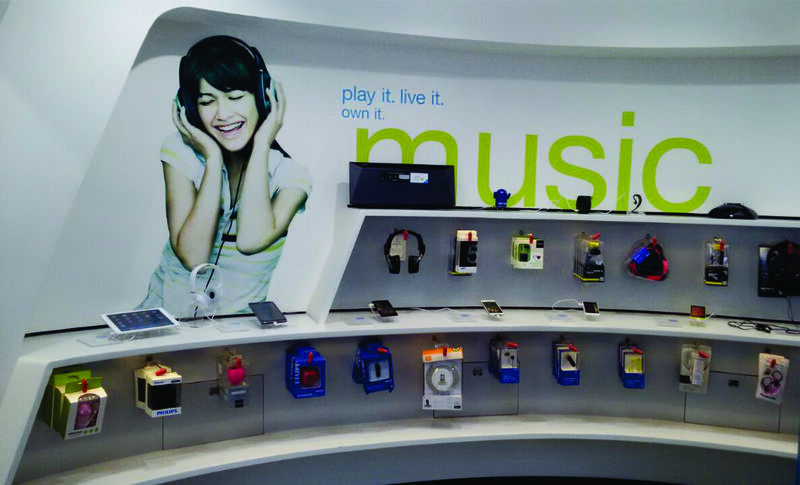 Music zone has specially selected docks and headphones/earphones geared to make music experience with the smart phone easy. – Each phone displayed has the accompanying earpiece that the manufacturer provides. Univercell push the accessory they recommend instead to be purchased for a better music experience. 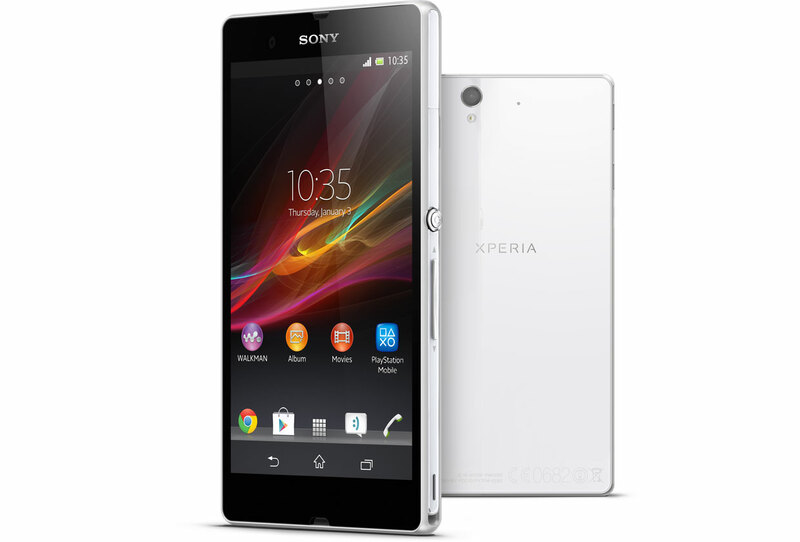 – A bundle offer can be introduced with an accessory of headphone and memory card plus phone cover. This zone is dedicated to all trigger happy customers, amateurs and professionals. A fun photo booth powered by the best camera phones helps customer experience their phones, compare pictures before then buy. This zone is also supported by all the must haves for a photography lover- like extra memory, extra battery, etc. This Zone is a mix of Productivity and Gaming. The best phones for work, loaded by the best productivity apps bring alive how a smartphone can really power up your life Phablets and Tablets with exciting gaming apps lets you experience how you can play while you work .This zone also brings alive all kinds of accessories that takes multitasking to its absolute limit. Conveniently place at dedicated corner are tablets and phablets, this zone has various brand tablet and phablets showcased, tablets are widely used in almost all streams of life, from toddlers to school kids, youngsters, professionals, housewife to grandpa.Considering the importance of tablet some useful tablet gyan is handle full to have a in-depth of which tablet will suit whom. 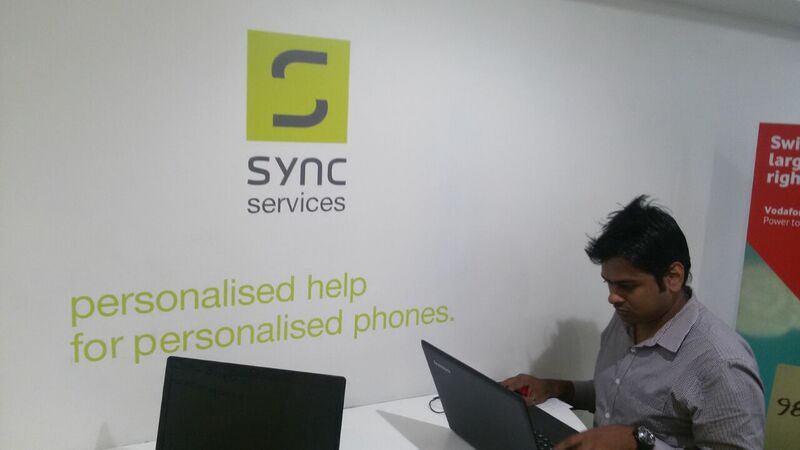 Sync allows you to have a hands-on feel of the product you want to /intending to purchase, understanding the features live such as play, music, browsing, usability to name a few, and to get a feel of the device is always a plus while making a choice of purchasing, which is well thought concept of Univercell. 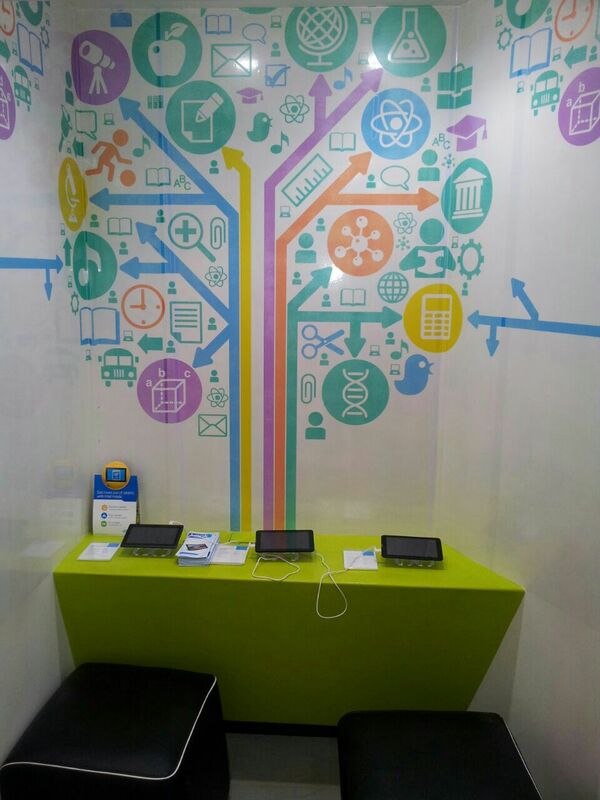 5) Tank your phone – Assistance in buying e-book and app, help pick right data plan, bill payments and top-ups. 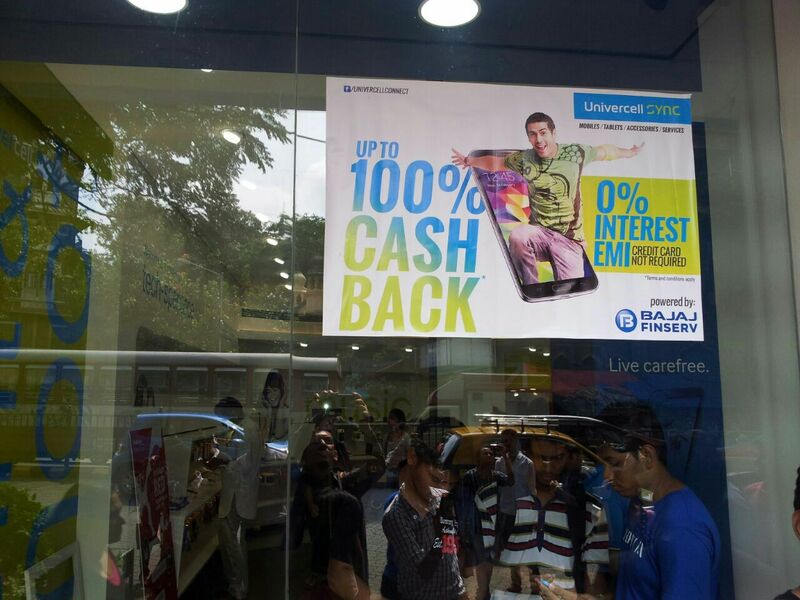 1) Upto 100% cash back scheme – If you are a credit card holder, just swipe the card for down payment and the rest is taken care of by the Univercell team, they will calculate and let you know how much cash back percent you earn as per their algorithm, the branch manager told me that few customer have won complete 100% in 3 months, that awesome isn’t it. 2) Easy EMI’s with no processing fees and 0% interest: This service is provided by their financial partner Bajaj Finance who offer this at a hassle free documentation process and minimal approval basis of personal documents. 3) Flexi EMI’s: Yes, you can also avail EMI’s upto 24 months if you have a credit card, you shall be charged a minimal processing fees and interest. 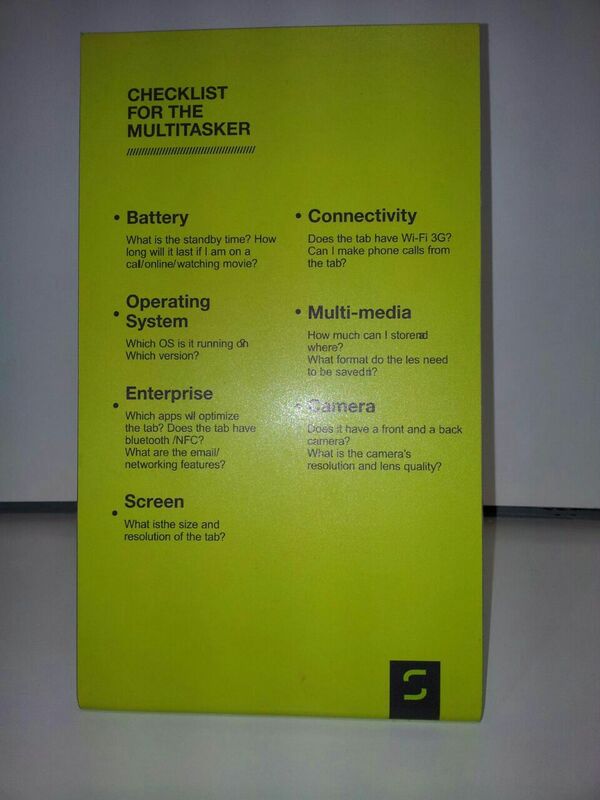 1) In all three segments, beside the phone / accessories there were description table in which all the details of the phone were mention which is helpful when you are comparing the phone with one another or simply going through the specs, also mentioned are some pointer to whom the device is most suitable, which I found really helpful. 2) In all three segments there were no price mentioned beside the phones/accessories, sounds interesting and it is, when I asked the branch manager about the funda, he politely answered saying we deliberately did it so that customer would ask the price to us and we could interact and help serve the customer better with our different schemes and discounts to help achieve the desired satisfaction, which again is a well thought initiative. 3) While I was browsing the various segments of the store, every segment had a dedicated Customer help executive who had a lot of idea about the particular segment, brands and best deal, I was impressed with their helpful nature and a sense to customer satisfaction when it came to selecting a product or simply asking for options. Even the branch manager of the store pointed out that it’s all about making people more comfortable and helping them sort options. 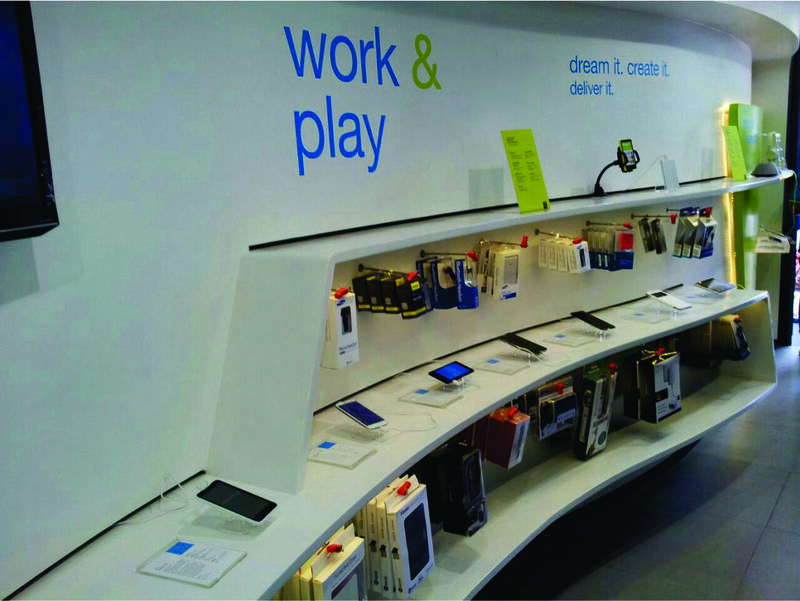 4) Range of accessories at the store was phenomenal, from screen guards to covers, panels, car mobile accessories, you name it and its there, and even so they had dedicated accessories for each handset on display which is a rare in other retail store or at other private outlet. 5) Feel of store was very friendly and the executives were very dedicated to provide proper support to queries and helping find what you actually require, satisfaction is their mission which is fulfilled at many level to what I have experienced , while I was navigating the store and having a quick chat with the Brand Strategist, Branch manager and support staff. 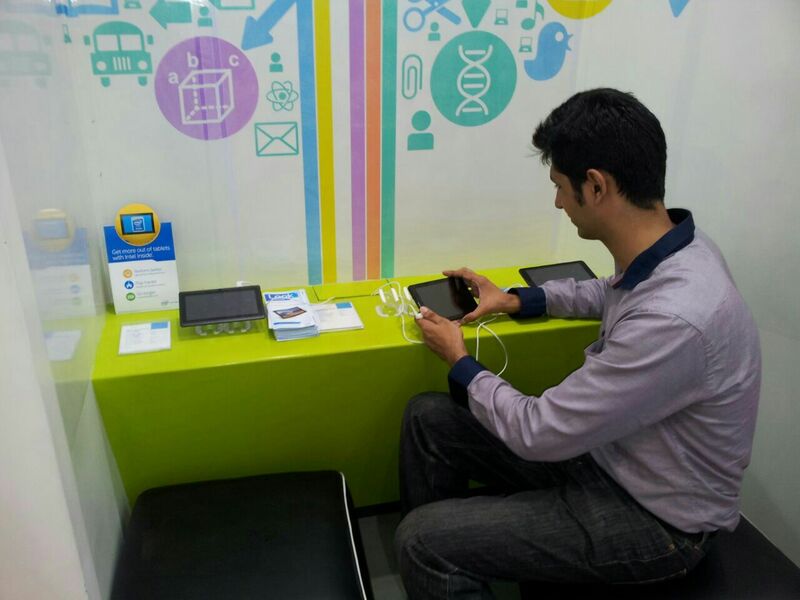 Overall, I was glad to visit the store at Univercell, came to know about some fabulous services and support for phones, besides that some very well staged phone segments and accessories at display, a must recommend to anyone buying a new phone and accessory just for their support and effort to provide the customer according to their needs and demands and gaining satisfaction. Now a days life has become just so much simpler with the advancement of mobile technology, I think that work which use to take up days are now done in minutes, more so with the advancement of portable technology it has gone to a far new level with access to media and data on the go, we have virtually become human robots ourselves. For a person like me who is constantly on the move I always wished that I had a portable laptop which fulfills all my tablet needs with the comfort of a laptop features and configuration, all in one and on the go. Sounds impossible don’t it! 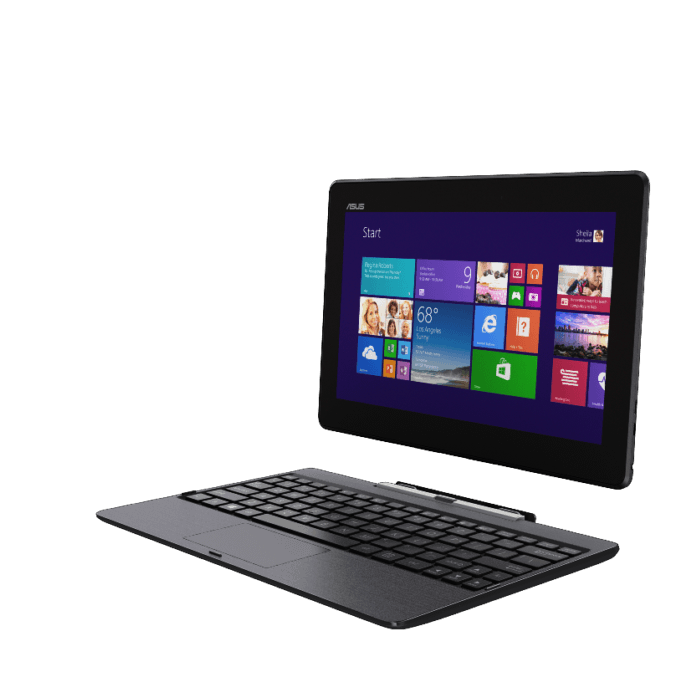 Let me share some of the cool things I could do / which would keep me hooked to Asus “Transformed” T100 ! 1) Browsing and researching on internet with its efficient processor and WIFI. 2) Performing Multi-Tasking smoothly with its Atom Qaud Core PROCESSOR. 3) Online Conferences and live face chatting on the go! 4) Reading E-Books, Magazines and Newspaper. 6) Watching full length movies and tv series with its super 10+ hour battery life. 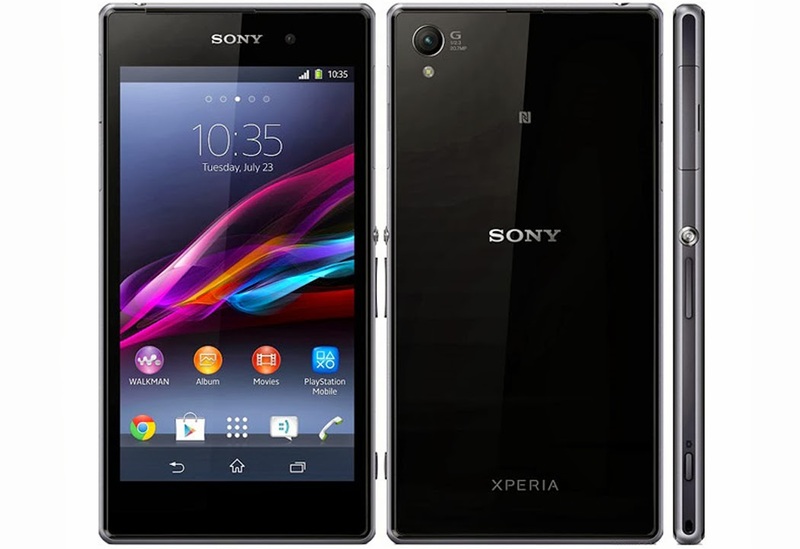 7) Playing games on its rich experience 10.1” HD IPS image display and touch screen. 1) Detachable freedom: Yes, it’s a dream for anyone who is travelling or on the go to have a single device that takes care of both the needs of laptop and tablet, it’s great to have the freedom of moving with a power house that has the capability of both a tablet and laptop considering you won’t have to carry a extra device. 2) Processor : With the help of its Quad Core Processor, viewing, editing your office documents, preparing a power point presentation or a excel datasheet on the move is so easy, with the help of a proper physical touch and keyboard interface it just adds to the comfort. 3) BATTERY (In bold letters) : Yes, battery plays a significant part in portable devices, but what if you get a battery life of around 11 hours from a laptop and tablet at the same time, sounds like the best thing to the ears of any one on the move, a definite YES YES situation! 4) Ultra portable: A device which is sleek and handy to carry is what everyone wants now a day’s specially youth and people travelling or on the move, with detachable capabilities and features of tablet and laptop, it’s just fits the mind to have a device like it. I am already convinced with all the cool features it has and the package it is giving, it’s a serious and well equipped mean machine for all the travel lover and on the move people with features of a tablet and laptop well combined to suit the needs of this fast moving on the go world where time is key and portability is a necessity.